Chair Covers by Sylwia offers Manzanita Trees in three different colors: white, silver & gold. These trees are truly custom, and can be decorated to fit any budget. 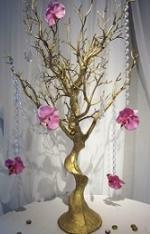 Trees can be adorned with crystal chains, faux flowers, hanging tea lights and much more. Trees are also available for pick up for clients which would like to decorated the trees themselves.